I had written this entire intro prior to watching this episode about how we should probably start readying ourselves to bid Deke adieu. The show had been moving towards him and Max breaking it off with no hope of reconciliation for some time. That and the fact that Eric Andre’s joining FX’s upcoming comedy Man Seeking Woman as one of the main cast. Altogether it seemed to point towards us not having much longer to enjoy the presence of one of my favourite Blewish [that’s half-Black half-Jewish] comedians. This is literally the last time I’m going to bring up the rom-com narrative style that has permeated the show basically ever since Deke showed up [first mentioned back in Episode 13]. He and Max have had their ups and downs, but it all came to a head last week when his parents decided to cut him off completely. When last we saw our heroines they were on a mission to push Deke’s dumpster house clear across the city in order to reconcile him with his folks, trading his relationship with Max for financial stability and overall a better life. As far as I can tell that is the end of Max Black and Deke Bromberg. IMDb only lists all eight of the episodes that Eric Andre has already been in, so at this point I think it’s safe for me to call it. This of course means no huge emotional climax for the two, no firm conclusion to their relationship that we as an audience are privy to. No, instead we’re moving on to an episode that revolves around celebrity guest appearance Lindsay Lohan. Look, she does a passable job at playing indecisive bride-to-be Claire. The very, very brief role for Stephanie Courtney [ie. the ever-Progressive Flo] as Eleanor, a neurotic wedding planner was thoroughly enjoyable. Kat Dennings and Beth Behrs together take part in the most enjoyable bit of physical and set comedy I’ve seen on the show ever, involving them carrying a cake onto a subway car and having their seat taken by an old woman, being hemmed in by two blind men, and besieged by a breakdancer. At the end of the night, though, I wasn’t satisfied. I fully realize that it’s no HIMYM finale, that much should be said. Even still, I can’t help but feeling robbed of the end to a relationship that I was, for better or for worse, invested in. It cheapens it as a whole, and in spite of the references to Max’s sadness that they were sure to seed throughout it felt almost like it had never happened. Ultimately this was just some episode about how bridezillas are a thing that exist. Max and Caroline’s friendship isn’t stretched to any levels, and as a whole it was just a gimmick. An fairly entertaining gimmick, but a gimmick nonetheless. You know how often that was brought up? Literally never. New Total: $2,650. This makes zero sense to me. As far as I can tell Caroline received money for the cake they made for Claire’s wedding, yet this New Total shows a deficit of $200. The only solution I can come up with is that Max used so much ingredients to match the bride’s shifting requests that they didn’t break even. See 1 broke guy’s explanation in the comments below. The Title Refers To: Caroline sees what Max has baked and tells her “That’s quite a cake cake cake!” I have no idea of this is a reference to anything, but the audience thought it was funny. Caroline cries to get bigger tips, which should be a surprise to absolutely no one. Lots of tax talk this episode, which is exactly the kind of reality I don’t like to be reminded of. I legitimately didn’t understand the joke involving the shot mannequins, “draw a teardrop on your face and they’ll move it to Banana Republic.” Assumed it had something to do with gangs. Scrubs did the double-vasectomy [and double reversal] joke first. The song playing during the dance is Sam Hart’s “Mario Kart Love Song”, so huge props to whoever made that happen. You should all read this thoroughly enlightening account of someone who attended the live taping of this episode. Max’s joke that made me feel legitimately uncomfortable: “Man, why does every uncle I know try to screw me?” I literally grimaced. 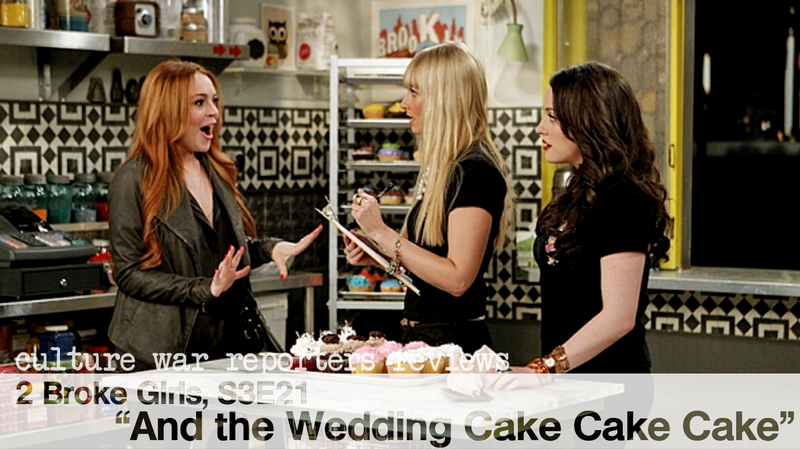 2 Broke Girls Cheesecake Menu: Nothing of note, really. Refer to the gif above, I guess. This entry was posted in celebrity, Comedy, relationships, review, television and tagged 2 Broke Girls, And the Cake Cake Cake, Beth Behrs, Bridezilla, Caroline, Cast, CBS, conclusion, Current Total, dance, Deke, Don't Trust the B---- in Apartment 23, Eric Andre, Flo, Kat Dennings, Lindsay Lohan, Mario Kart Love Song, Max, maxoline, progressive, relationship, review, S3E21, Sam Hart, scrubs, song, television, TV, wedding. Bookmark the permalink. Caroline finds out that she and Max owe Uncle Sam $1500 when she does their taxes (one of the few times she gets to use her degree in finance). They get paid $1300 for the cake (well for Styrofoam wrapped in fondant) and so they had to take $200 from their total to pay off the said $1500. As far as I can see, there is nothing wrong with the math. I remember that they owed money from taxes, but didn’t connect the fact that since the original wedding cake was $1300 that they’d be getting paid the same amount. You’re right, though, your math checks out. That section now points people down to your comment where you explain it like it is. I’m actually assuming it was some kinda pop culture thing I’m just not in tune with. That, or maybe they thought Caroline’s line was so hilarious that they decided to go with it for the title. Your an idiot for not getting the stray observations you listed . All credibility lost. Plane landing in the Hudson River a few years ago??? A tear drop tatoo representing a murder committed?? I know why people get teardrop tattoos, I just didn’t get the connection between gang violence and moving the mannequin to another storefront. 2 Broke Girls is filmed in front of a live studio audience. I HATE that Deeke is out. The relationship he and Max had was hysterical and perfect. Amazing the way they played off each other. I think the funniest episodes included. Sob…miss him.